So how do you know if the turbo has gone on your Peugeot 308, 407 and 307 1.6 HDI, well the first thing I would recommend is to check for lots of smoke when you drive, also check the dash display if it reads Depollution System Faulty. If this is the case then you have probably noticed a large drop in power and an unusual turbo whistle or turbo whining noise. I am sure buy now you are thinking why has the turbo on my Peugeot 407, 307, 308 1.6 HDI blown so soon as the car has low mileage, well its to do with the engine they use in these models. In fact the 1.6 HDI engine is used in Peugeot 308, 407, 307, 207 and some Citroen models such as the Citroen C4 Picasso, Citroen C4, C5, C2, and C3, I am sure I have misted one or too but the point is, they both use the 1.6 HDI engine and unfortunately it seems to suffer from turbo problems. Turbo failure is very common on the Peugeot and Citroen 1.6 HDI in fact it is so common we have devised our remedy to prevent future turbo problems once you have the turbo repaired. Remove oil sump from bottom of engine, wash it out and thoroughly dry it, replace the main oil pick up pipe which bolts onto the bottom of the oil pump, there is a wire mesh type filter inside the pick up pipe which can get blocked very easily, refit the sump. Fit new oil feed pipes and oil return pipes going to the turbo as they are probably blocked up with gunge, remove all breather pipes and clean them out, replace all crankcase breather filters, they are normally on top of the rocker cover or on the air box. Remove and clean out the oil filter housing, refit it and fit a new oil filter, fit the reconditioned turbo and fill the engine with oil. 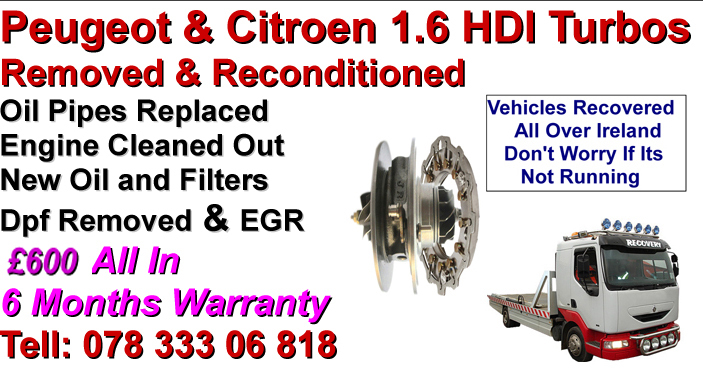 This is a brief outline into what needs done, the actual work it self is much more involved than we have stated and at Hagans Autos we specialize in Peugeot and Citroen 1.6 HDI turbo repairs. My Mazda 6 Diesel had an intermittent turbo boost problem, so having found Hagans Autos via a Google search I arranged for Colin to have a look at it. He diagnosed the problem very quickly and thankfully the repair was really simple. Thanks Colin! My Bmw 320d M sport developed a turbo problem a few weeks ago, I went onto Google and searched for Bmw turbo repairs and found Hagan's Autos who specialize in turbo repairs and dpf removals. I left my car with Colin and he sorted it in just a few days, car is going great now thanks to Hagan's Autos.